Birthdays… After 30, birthdays serve little purpose; however, this year I decided to go out in style. I contacted Binnys (Thank you Brett) and ordered three birth year bottles. 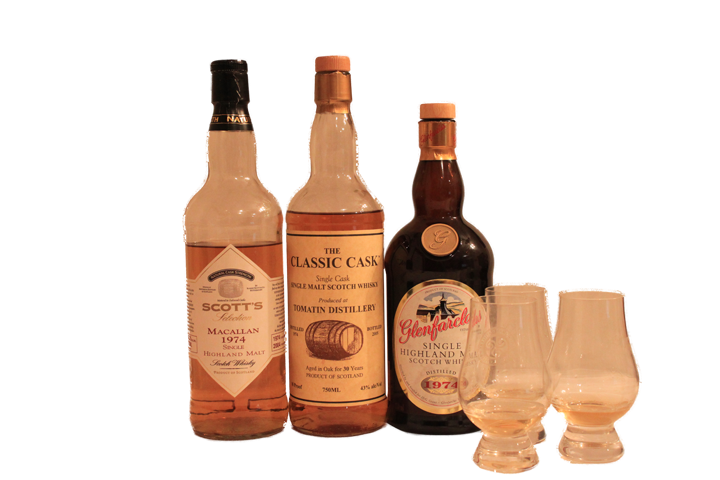 That is to say, three bottles cask in 1974. I had always wanted to taste a birth year bottle, and this was my very first exploration into that realm. 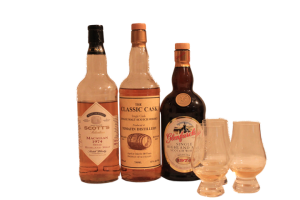 I am (for the most part) a lover of young and fiery peated scotches and these older bottles are quite a radical departure from that norm. I usually do not love older drams; however, I was quite surprised with these bottles. Nose- Sweet notes hints of oak and honey, and oatmeal cookie. (Ammie’s Nosing notes) Lemon, very sweet – leaning to lemonade, Apricot, and brown sugar. Light and fruity and notes of wine. This was the stunner of the lot. Very light on the palette—notes of oak that quickly transition into a body with hints of apricot. As quickly as these notes appear they vanish in a silky soft finish of light oatmeal cookie. This is the finest old Macallan I have ever tasted. If one could drink velvet, this would be it. As soon as the light magical flavors pass you just want another dram. This was one of the finest 30 something scotches I have ever had. On my palette, older scotches taste somehow flat. The oak often overpowers, and (to me) the whisky falls flat. This is a perfect example of what older scotches can become. (Ammie’s Nosing notes) fresh saw dust, green apple. This is an incredibly sweet and complex dram. The body is a mixture of honey and plum that transition to a finish ending in a puff of smoke. This dram is incredibly hard to pin down as each time I have tasted it, I have noted something different. The flavors come on strong, and take your taste buds for quite a wild ride that ends in a Smokey flash. This is a classic Farclas, and if you are inclined to like sweeter drams (older bourbons, Ben Riach) you will be truly happy with this bottle in your collection. For me, that initial burst of sweetness was just a touch overpowering. If I could have muted this one trait I would have rated it in the 90’s. Nose- oatmeal cookie, standard “old dram” notes. This is a delicate dram with lights notes of honey that stay right on to the finish. In many a way it reminds me of the delicate composition of an Oban; however, unlike the Oban, the finish has quite a punch. Just when you think this dram is gone, it comes back with a lovely spike of heat that is comprised of faint traces of pepper and hoppy goodness. The notes of hops stay around for some time after the other flavors are long gone. The finish is the really saving grace on this sleeper. It is an excellent older dram for an excellent price. The label on the Tomatin looks like John McDougall’s Golden Cask labels. Is the Classic Cask label an alternative label name of his for the US ? Thank you Steffen. It would appear that Classic Cask is a bottling by Spirit Importers. A Company actually not too far from where I live! Perhaps I can pay them a visit. The very best Scotch whisky experience. Single Malt Whisky available online now. humanos, que es el objeto de estudio.